In 1988 the Arkansas Archeological Survey (ARAS) and the National Park Service (NPS) Southwest Region entered into a long-term cooperative agreement to conduct archeological research on national park lands in Arkansas. Soon after, in March of 1990, the Survey was designated as a repository for archeological collections from Arkansas Post National Memorial and the Buffalo National River. This involved providing curation facilities and services in compliance with the new federal curation standards (36 CFR Part 79). 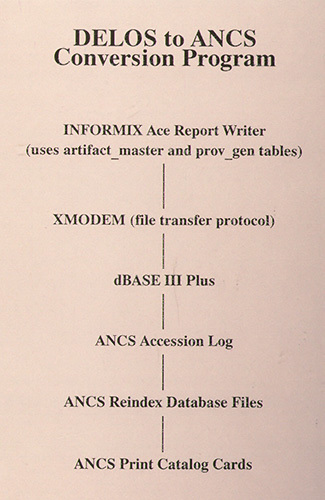 Schema for the DELOS to ANCS conversion program. Under the direction of Dr. Charles R. McGimsey III, Kathy Cande and Jerry Hilliard revised the Survey’s curation standards and fee schedule to reflect current costs and practices. We created a mechanism for accepting and reviewing new collections from NPS sites in Arkansas. A new curation plan for federal collections was also written. One major step in upgrading the condition of the collections involved replacing acidic cardboard storage boxes with stable Rubbermaid brand polyethylene boxes. Old non-zipper type artifact bags closed with metal twist ties were also replaced with 4 mil polyethylene zipper-type bags. Under a series of sub-agreements, the Survey undertook inventory and cataloging of Arkansas Post and Buffalo National River archeological collections. We proposed to create a computer program that would take artifact and provenience data from our existing database system, called DELOS, and link it with collections management data required by the National Park Service. The “conversion” program was successful and allowed us to encode our artifact and provenience data into the Park Service’s Automated National Catalog System (ANCS) in a timely fashion. It also ensured that both ARAS and NPS accession and catalog numbers became part of the inventory database. We are the only organization in the country that created such a program. We continue to assist park staff who visit annually to do random sample inventories to assess the condition of the collections. The system permits effective searches of the collections to identify and retrieve specific objects for museum display. We have been able to select suitable objects for many exhibits and venues in Arkansas, including the Historic Arkansas Museum and the State Capitol building. It also facilitates new research on existing artifact collections. The success of these applications prompted NPS to turn to us again for curation of Pea Ridge National Military Park collections and a set of Fort Smith National Historic Site records. We were able to include a state-of-the-art curation facility in the plans for a new Survey building that was completed in 1998. Our 13,522 sq ft facility is climate controlled, with a mobile storage system and fire suppression/detection system. The Arkansas Archeological Survey is currently negotiating with other federal agencies (the U.S. Army Corps of Engineers, for example) on agreements to curate additional collections. 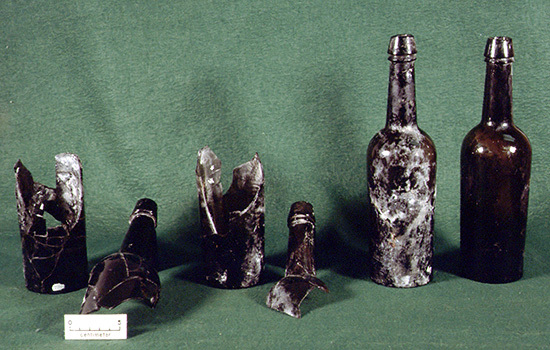 Dark green glass stout bottles from Arkansas Post cataloged for the National Park Service by the Arkansas Archeological Survey. 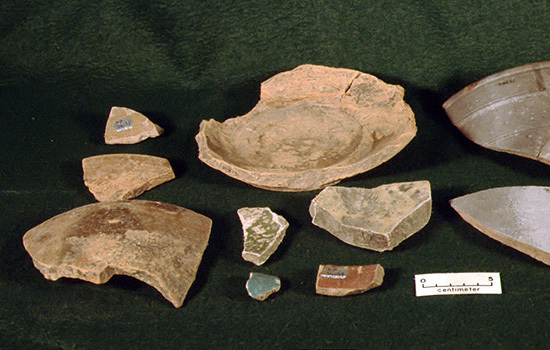 Coarse earthenware vessel fragments from Arkansas Post National Memorial cataloged by the Arkansas Archeological Survey for the National Park Service.